Ahead of a crunch Champions League clash with Bayern Munich, the Liverpool manager took exception to a line of questioning. Liverpool boss Jurgen Klopp (file pic). 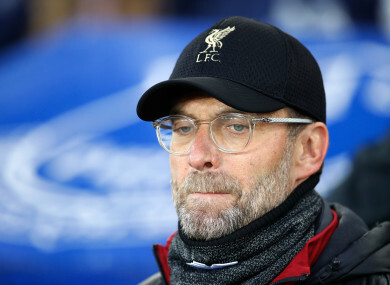 JURGEN KLOPP SUGGESTED “Manchester United pundits” are behind questions about whether Liverpool’s Premier League title chances would be boosted by exiting the Champions League. Liverpool, a point behind defending champions Manchester City in the Premier League table, take on Bayern Munich in the second leg of their last-16 clash on Wednesday, having drawn 0-0 at Anfield. Former United defender Gary Neville has suggested Liverpool would have a “clear run” at unseating City if they were to go out of the Champions League at the hands of the German giants. City are still in the FA Cup, having reached the quarter-final stage, and Pep Guardiola’s men have already won the EFL Cup, whereas Liverpool were knocked out of the former competition by Wolves. Klopp, however, believes other managers would not have to respond to whether it would suit their league campaigns if they were no longer in Europe. “I really don’t think any coach in the world has to answer this question in the Champions League,” Klopp told reporters. “It’s really unique, it only happens to Liverpool. “The pundits come from Manchester United and start this thing. If you play this competition, you asked after we went out in the FA Cup, in the EFL Cup, if it’s better. We don’t see it like this, we wanted to go through but didn’t. Even if it would harm us, we could not change it. The whole world watches this game. I wish the guys who write down this question, they try to prove some day it’s possible to use their ideas in real life and not only in the studio. I’m not mad, we just constantly get confronted with this. Klopp also shrugged off a question about Liverpool’s apparent lack of threat with shots from distance, suggesting being without Alex Oxlade-Chamberlain due to injury has contributed. “How many goals did we score, 68 or so,” Klopp added. “In Germany we say if you don’t have problems you create your own, it sounds like that. If you moan with what you don’t have you can’t be happy. [Philippe] Coutinho is not here and he was maybe responsible for 60 per cent of shots outside the box, Ox didn’t play a lot and I remember two outside the box last year [he scored], both against City, that’s how it is. It’s no problem. Email “Jurgen Klopp hits out at 'Manchester United pundits'”. Feedback on “Jurgen Klopp hits out at 'Manchester United pundits'”.